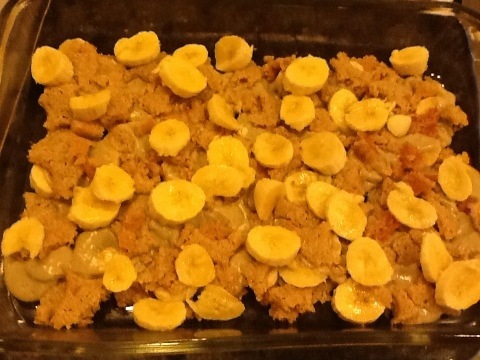 I has a hankering for banana pudding, but not just any old banana pudding. I’m talking about Southern banana pudding, the type with layers of vanilla wafers and banana in between vanilla pudding. I usually make an easy recipe from the box of Publix vanilla wafers, which calls for horrifying ingredients such as non-dairy whipped topping and boxes of pudding mix. The girls almost fired me as their mom the last time I brought home a container of cool whip. I searched for a Paleo recipe, but I could only find recipes for the pudding itself. I settled on making these almond flour cookies . I just omitted the step of dipping them in chocolate. I rolled out the cookie dough as instructed. 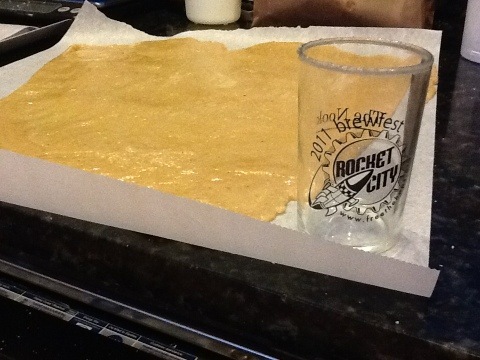 I attempted to cut out cookies with this taster glass. 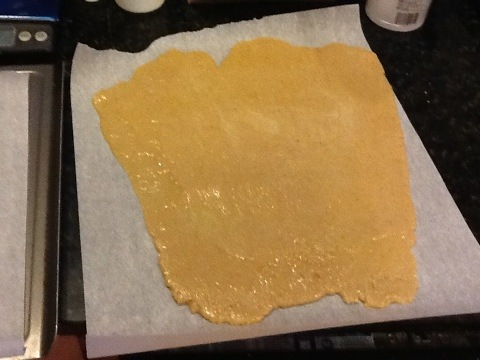 However, the dough kept melting back together, and it was impossible to remove the cut out cookies, so I just baked them as a sheet. While they baked I started the pudding. 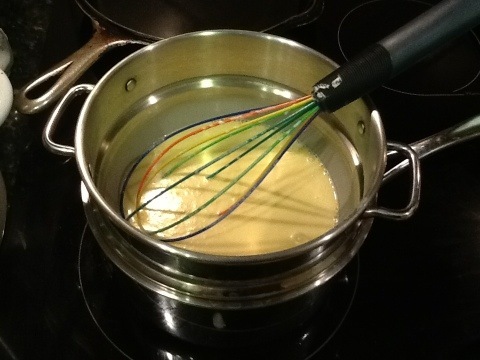 I whisked the coconut milk, egg yolks and vanilla together in my double-boiler. 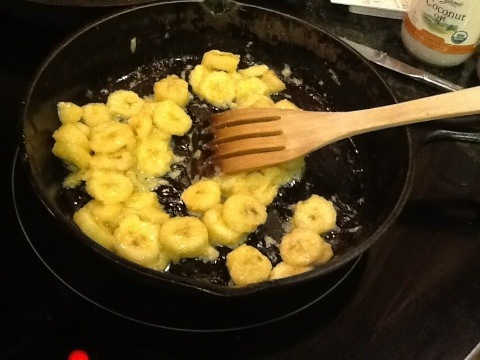 I sautéed the bananas & cinnamon in coconut oil and butter until slightly carmelized. 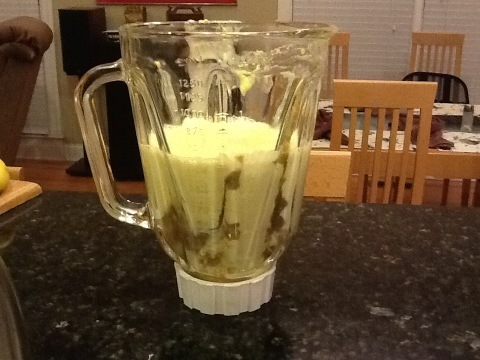 I combined the coconut milk mixture and the bananas in a blender until smooth. By this time the cookies were done. 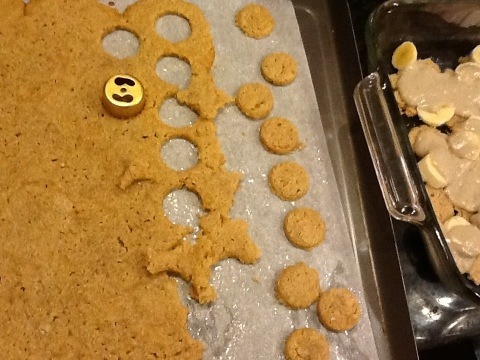 I used a doughnut hole cutter to make small cookies. Since these were soft cookies that held together well, this worked great! 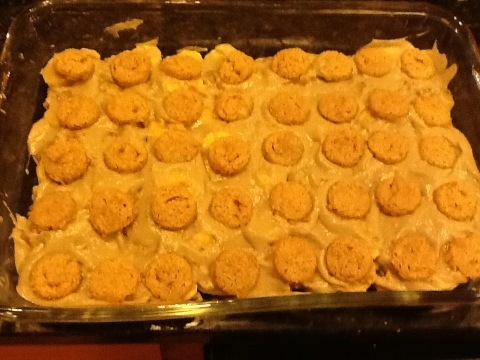 I layered the cookies, sliced bananas (I used 3, which were in addition to the bananas in the pudding recipe) and pudding twice in a glass casserole dish. The pudding was quite attractive! Jewel and I liked it better than my regular banana pudding. It’s less sweet and has more banana flavor. This is still a high calorie and fairly high carb dessert, but it contains real food instead of empty calories. I had cookies leftover, so another night I drizzled leftover chocolate sauce from the chocolate covered bacon over them, and we gobbled them down! Thanks! I thought it was fantastic! I am going to be trying this one as soon as I have some time. Maybe this weekend. I need something to satisfy ana’s sweet tooth! Just started the paleo today. So far so good. Excellent, Jodi! Glad it’s gone well so far. Hope Ana likes the pudding!